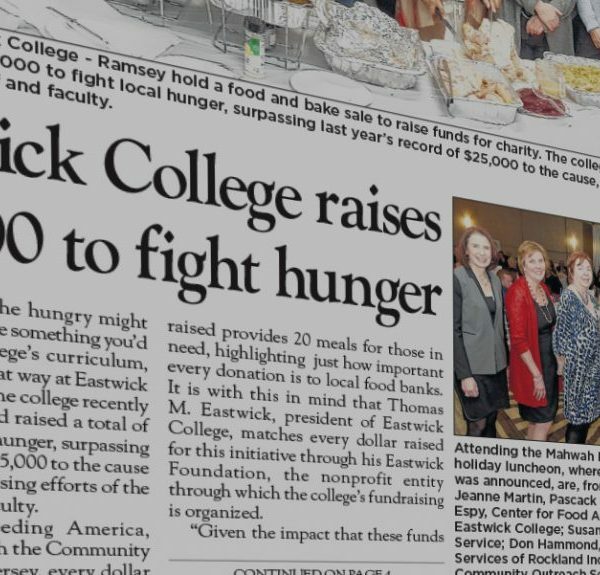 Helping feed the hungry might not sound like something you’d see in a college’s curriculum, but it certainly feels that way at Eastwick College in Ramsey. The college recently announced that it had raised a total of $30,000 to fight local hunger, surpassing last year’s record of $25,000 to the cause thanks to the fundraising efforts of the students, staff and faculty. According to Feeding America, which is affiliated with the Community Food Bank of New Jersey, every dollar raised provides 20 meals for those in need, highlighting just how important every donation is to local food banks. It is with this in mind that Thomas M. Eastwick, president of Eastwick College, matches every dollar raised for this initiative through his Eastwick Foundation, the nonprofit entity through which the college’s fundraising is organized. “Given the impact that these funds will have — making sure that someone doesn’t go hungry — $30,000 will go a long way and I couldn’t be prouder of everyone at the college for the hard work and dedication they put in to reach this goal,” Eastwick said. “I hope we see an even more successful fundraising campaign in 2016.” Community action plays a big part in the student culture at Eastwick College, thanks in part to the philanthropic vision and investment of Eastwick, who was named Humanitarian of the Year by the Mahwah Regional Chamber of Commerce in 2013. Starting the college in 1985, he set out to build a school that would be more than just another business in town. Instead, he envisioned it as an active member of the community, attending and contributing to local events, forming connections with the residents and encouraging its student populace to the same. One of the more unique ways that Eastwick College does this is through hands-on charity service that allow students to practice their new skills while helping others. In Hackensack, nursing students provide free blood pressure screenings for local residents at town events, and in Ramsey, health science students help those in need to plan and buy healthy meals. Students also: assist with blood drives; raise funds for organizations like Smile Train and the American Heart Association; volunteer for local community outreach programs such as “Lighten Up Ramsey” that helps track residents’ diet and exercise achievements to reach collective goals set by the town; support local organizations directly such as The Forum School, an educational facility for children who are developmentally atypical, in which students helped set up and install a sensory garden and assisted with a recreational climbing program. A unique donor-based scholarship program also is offered through the Eastwick Foundation, which helps ease the cost of a college education by providing partial to full scholarships for programs at the college through donations from corporations and individuals. The scholarships are open to all high school graduates, and are awarded based on merit and the evaluation of a written scholarship exam. In addition, the Eastwick Foundation has partnered with the Good JuJu Project, a not-for-profit preschool program in Negril, Jamaica, that assists families in need with their children’s preparation before entering elementary school through Eastwick’s affiliated Good JuJu Project. For many children, this can help ensure that they get on the path to a comprehensive education and lead to greater opportunities for them later in life. To learn more about how to help with Eastwick’s campaign to fight local hunger, visit The Eastwick Foundation online at eastwickfoundation.org. For more general information on the college and the programs that it offers, call one of the campuses or visit eastwick.edu. Eastwick College offers a wide range of degrees and accelerated certificates for careers in health care, trades, technology and business, including licensed practical nursing (LPN), occupational therapy assistant (OTA), cardiovascular sonography, electrician apprenticeship, computer/electronics, and business and hospitality.